I think we can all agree that the camera app is probably the worst aspect of the Essential Phone. Even though the US company released quite a few updates, the camera app is not there yet, so many Essential Phone owners might feel frustrated that they can't install third-party apps. Still, the updates continue to come for the Essential Camera app, so hope is not yet lost. The latest update that the Android app received this week doesn't bring any new features into the mix but certainly contains some improvements. The most important change is the speed with which the camera can capture photos. 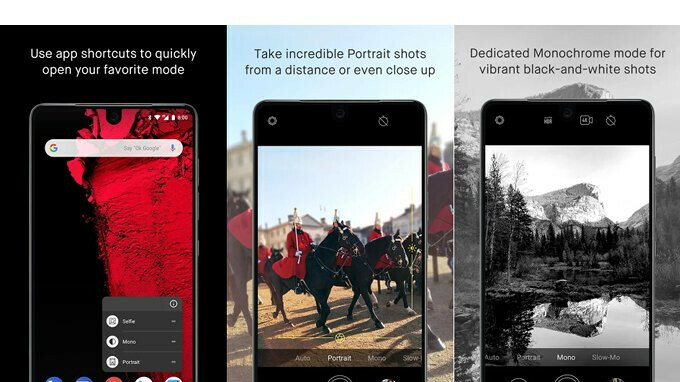 Essential says the latest update should further improve animations, as well as photo capture speed across all camera modes, including Burst mode. Additionally, various stability fixes have been implemented too, so you should feel the camera app much smoother after the update, which, by the way, is already available for download via Google Play Store. Just download the Google camera apk. Has done wonders on my LG v30 plus. What benefits are you seeing? Just improved image processing? I might try it on my Note 5 but I'm afraid that I won't be able to use the camera launch shortcut if Google Camera is my default camera app. I like the fact that Essential keeps improving their software and do not limit themselves to security updates. I agree. I might get the Essential Phone because of the continued support of the phone & consistant updates. I bought it a little over a month ago because my Note 5 was starting to crap out. It was definitely worth the $450 price tag for me. A couple of notes though: - Don't get it for the camera. Low light performance is actually really bad, and overall it's not competitive with higher end phone cameras. - Get it for the hardware. The build quality, design, speakers are all pretty good for me. - Get it for the software. Stock Android. No bloat whatsoever. - Get it for being on the latest Android. Been running 8.1 since I got it. - Get it if you're on Verizon and don't need the Pixel. It's one of the few unlocked phones that has CDMA, unlike alternatives such as the One Plus 5t. - Don't get it for the constant updates. The frequency of updates thus far was necessary to fix initial problems, but now it works well, so I don't know if updates will be treated as urgently. "so many Essential Phone owners might feel frustrated that they can't install third-party apps." For real? I thought all Android phones are able to install the 3rd party apps. Don't mind PA. I had the phone and I was able to download and sideload third party apps. Well I think sideloading and being able to install 3rd party apps from the store are two separate things, and I think PA was referring to the latter. Although they're still somewhat wrong; you can install 3rd party camera apps. But you CAN'T install the Google Camera app that gives you better image quality without sideloading. I'm thinking about picking one up.... How is the Reception? Better than my Note 5 was, so...pretty decent? I've had no problems so far. The camera is okay speed wise, but hope they focus on improving the low light image quality!